Illustrated articles about cool and common Pacific Northwest bugs! The life and works of the founder of Scarabs: beetle man and philosopher! The fun and not-so-fun events of a spider collector's life! 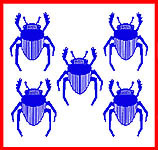  SCARABS MEETING NOTICES NEW!  Pacific NW Moths, by Scarabs Peterson and Crabo NEW!  Scarab Schimming's BugGuide, best arthropod photo site there is!  Scarab Pyle's Butterfly Big Year Blog NEW!  Leaf Litter Arthropods of Meso-America (Scarabs Feb. 2009 program!) NEW!  Washington Butterfly Association (a sister group of Scarabs) NEW INDEPENDENT WEB SITE!  Washington Butterfly Association Meeting Notices NEW!